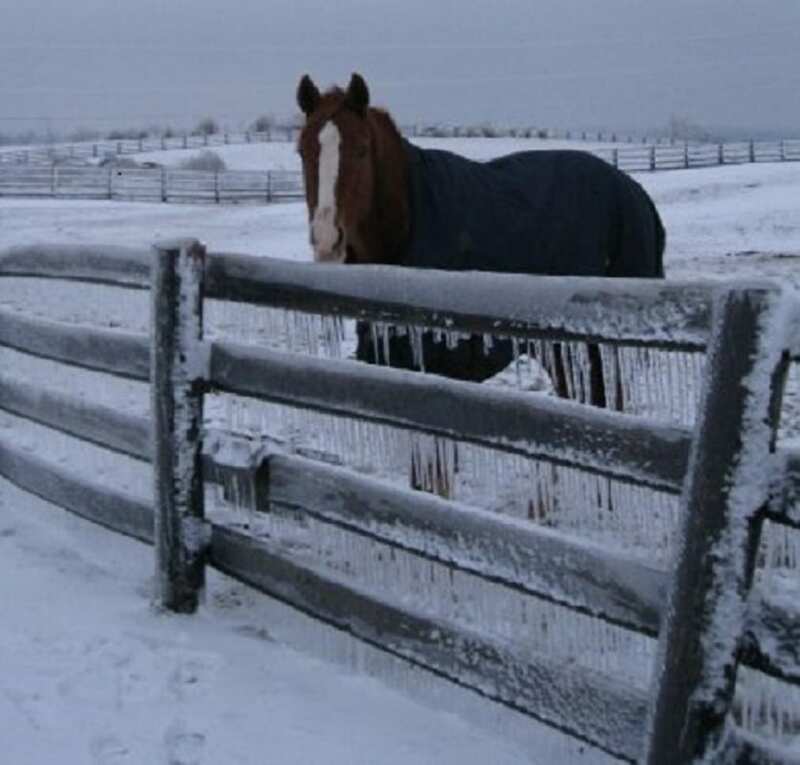 Icy conditions can make working on farms and around horses treacherous; frozen ground can be hazardous to horses and humans alike, whether working or playing outside. Christine Skelly of Michigan State University Extension says that while older, experienced horses that live outside may limit movement to eating and drinking, farm owners should consider moving feeders and waterers closer to shelters to limit their need to move over icy ground. Plowing fields to break up ice may also aid traction, and removing snow from high-traffic areas can reduce the water buildup in these areas, easing equine passage. Other ways to aid traction in icy areas include putting down sand, dirty sawdust, ash, or woodchips. Wetting the ground before applying these materials will help it stick. Removing manure from shelters and other high-traffic areas is also a mandatory chore; once it freezes to the ground it's one more obstacle for horses to contend with. Pulling shoes will reduce packed snow in horse's feet, which can strain tendons and bruise sole. If horses must remain shod, borium-studded shoes or winter studs will help with traction. Snow pads also reduce snow buildup in hooves. To help human handlers stay on their feet, consider traction cleats that strap onto conventional riding boots. Preparation for wintry weather begins in warmer months; build shelters in well-drained areas and consider using drains, fabric and footing materials around gates, feeding areas and walkways. Fence horses out of ponds to reduce the risk of falling into them in winter. Read more at Michigan State University Extension. This entry was posted in Horse Care and tagged borium, cleats, farm, ice, michigan state university, MSU, pond, safety, shoes, snow, traction by Paulick Report Staff. Bookmark the permalink.